In this lesson you will learn to define percents by using ratios. In this lesson you will learn to visualize percents by using 10×10 grids. 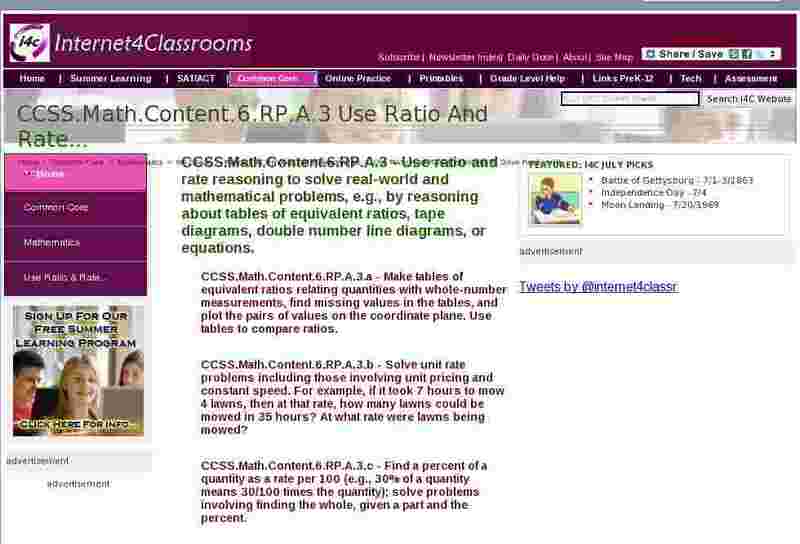 In this lesson you will learn to compare ratios by using ratio tables and percents. In this lesson you will learn to calculate the part when you know the percent and the total by using a double number line. In this lesson you will learn to solve percent problems by using a ratio table. Dividing fractions – Fraction Bar -This is a very versatile tool that can be used to illustrate a variety of number operations. Solve it! – Videos provide problem solving practice for students. Each set contains five multistep word problems with step by step video solutions. Concepts include basic operations, algebraic reasoning, money, fractions, percent, perimeter, area, proportional reasoning, and measurement. Understanding Experimental Probability – Experiment with experimental probability using a fixed size section spinner, a variable section spinner, 2 regular 6-sided number cubes or design your own number cubes. Understanding Percent – For each of the 9 problems on this page, fill in the missing value into the form, then click Enter. Your answer will be a fraction, a decimal or a percent, depending on the problem.